I'm an eclectic writer - fascinated by so many things, it's hard decide which idea to pursue next. I love suspense & mysteries, historical fiction, and non-fiction history as well. The idea for my new novel, JORDAN, had been simmering in me since childhood. I've always been intrigued by the idea of someone being able to heal just by touching others. A few years ago, the current state of outrageously fast viral social media made me rethink about it. What WOULD happen if someone like that appeared now? It didn't take me long to realize there was a good story there. I wrote a monthly humor column for 10 years, and often do humorous essays as blog posts, along with my reviews, writing tips, etc. I have three adult sons - who are amazing. I live in Key Largo, FL, with my significant other, where we have manatees swimming up to us right behind the house nearly every day. It's pretty cool. It's also a wonderful place to write. 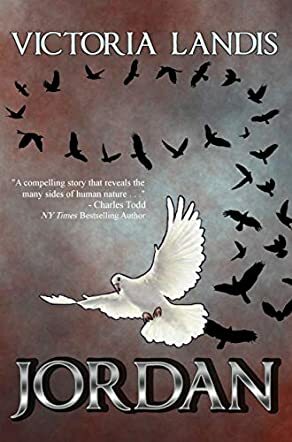 Victoria Landis has written a wonderful story about the titular character Jordan, who is discovered to have special powers seldom seen in humans. The book relates her reemergence into the world after having been missing for three years. Her limited memories of the past complicate even the simplest of questions: Where has she been? How did she get back? Is there a larger purpose to her new powers? Who can she fully trust? Why is she here? The secondary characters have their own reasons to discover the same answers. Jordan finds people she can trust and begins to work the task she has been given as best she can. But for every miracle there is an equal and opposite backlash. Can Jordan win through the gathering darkness into a better world? I found Victoria Landis' story to be simply superb. She very accurately (although optimistically in my opinion) predicts society's reaction to someone like Jordan. I very much enjoyed the parallels drawn from religion and mythology, right down to the names of the participants. The text is tightly edited and without wasted exposition, i.e. nothing structural will prevent readers from turning the pages to the very end. The characters assumed their own life and breathed, along with this reader. I could smell the smoke and feel the heat. Jordan's story doesn't answer all of the questions I had about her and those close to her, but hopefully they will be addressed in a sequel. I know I will be one of those eagerly lining up to see what's next!